Saundra Reiner is a painter & potter who works with porcelain and stonework clay bodies in the cone 8 range. Her porcelain work is often highlighted with 22 K gold. My passion is to marry form and function with colour and texture, to create everyday beauty you can hold in your hand. Saundra Reiner is a graduate of the Ceramic Program at the Toronto College of Art and the Fine Art Programme at the University of Toronto, as well as the Conservation programme at Sir Sanford Fleming College. Saundra worked as a conservator at the Bata Shoe Museum for 23 years. She currently lives in Uxbridge Ontario. 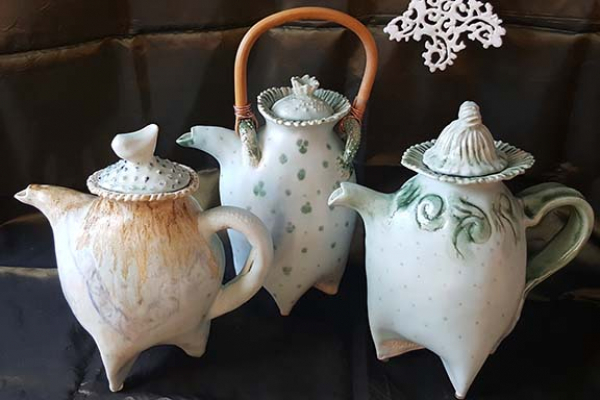 She has been working with clay for over 45 years and has won recognition for her work over that period. Saundra's passion is to marry form and function sometimes with colour and motion, to create everyday beauty you can hold in your hand. Saundra works with porcelain and stonework clay bodies in the cone 8 range. The porcelain is often highlighted with 22 K gold. "I hand-build, throw on the wheel, embellish, carve, imprint and reassemble the greenware to alter its shape and make it my own". 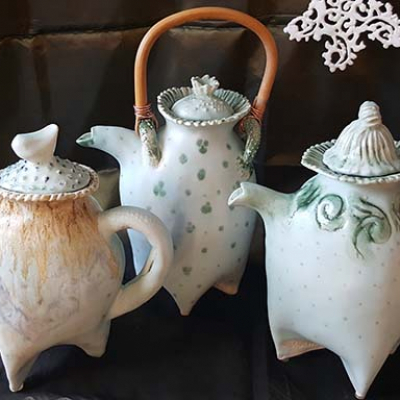 She paints motifs under and over her original glaze recipes. Saundra has been showing her work on the Uxbridge Studio Tour and working with the arts, political and cultural communities since 1991 when she move to the Uxbridge area. "I am an artist because it is in my nature to express my personal vision with my hands". Saundra is a practical person so much of her vision is functional. Marrying design, form and texture with humour is a hallmark of her style. "I'm in the mature phase of my work, but the direction continues to evolve".